I’m using a new book Alain De Botton’s quirky, exploratory text The Consolations of Philosophy to teach my summer course, the rather ambitiously titled Creative Reasoning and Investigative Learning: Critically Engaging Self & Society. Reading along with my students is a rare treat since I can be surprised by the assigned reading as my students are. This week’s chapter addresses the theme of inadequacy through a discussion of portions of the Essays of Michel de Montaigne. 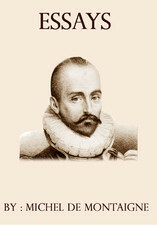 Every teacher of writing knows Michel de Montaigne as the “father” of the “modern” discursive essay, primarily because he was among the first to call what he was writing “essays” or “Essais” in French, meaning attempts, which casts a redemptively pleasant light on the endeavor to create meaning through reflective writing. Another important distinction of Montaigne’s work is that he wrote about anything and everything that interested him, sometimes including classical references and scholarly ideas, but most often not, thereby freeing prose writing from centuries of strict formality. Thus, the essays that my students consider excessively formal are actually a relaxed form encompassing a leisurely discussion of essentially anything. A lover of words, I am a fan of eloquent statements, a trait I share with Montaigne (one of several similarities I can draw between my life and that of a man who lived and died more than 400 years before me). Montaigne collected and considered quotes from thinkers he revered, decorating the ceiling of his library with his favorites. I’ve posted favorite quotations to my walls since college, more evidence of the deeply personal relationship we seek to build with authors and texts we admire, seeing in them what we want to see in ourselves. One of my favorite books utilizes Montaigne’s essays as a means of understanding life. I may have already mentioned or recommended it here: Sarah Bakewell’s How to Live: Or A Life of Montaigne in One Question and Twenty Attempts at an Answer. Bakewell’s writing style is equal parts fluid and fascinating. After finishing the Bakewell, I read Montaigne’s original essays because her explication makes them seem so fabulous, which they are to a large degree, the historical distance causing few difficulties. A brilliant scholar, Bakewell elevates her source material, identifying the most enthralling aspects and glossing over the rest. In fact, Montaigne’s essays were a tiny bit disappointing after Bakewell’s glittering overview, because they contain dull bits she chose to exclude. Alain de Botton’s exploration of Montaigne is decidedly different. He offers less in the way of interpretation; instead, he uses Montaigne to discuss the selected theme of inadequacy. Honestly, I would never have connected Montaigne’s work with the theme of “inadequacy” as De Botton has done, but the results remain intriguing. One of the central discussions De Botton supports with excerpts from Montaigne involves sexual inadequacy. When I think of inadequacy, my mind does not immediately jump to that of a sexual nature. I almost never contemplate sexual inadequacy. Indeed, I was surprised to see the subtopic as much as the connection to Montaigne. This, coupled with a different reading of a crucial part of Montaigne’s life reveals a wonderful attribute of interpretation—a great many are possible, and a large number can be valid, as long as ample textual evidence and sound logic make the argument reasonable. Another key difference between Bakewell and De Botton’s discussion of Montaigne pertains to his most intimate friend, Etienne de la Boetie. The friendship was exceptionally close, and while Bakewell considers yet ultimately dismisses a potential sexual aspect to the relationship, De Botton doesn’t address this possibility at all. The differentiation is analogous to two portrayals of Hamlet, an apt correlation because source material must be richly complex in order to support a range of responses. With the same source material, these two capable authors produce insights that are only potentially true, and certainly not all encompassing. Thus, all readers can and should add their voices to the conversation. I tell my students that if there were only one way to think about something, there would be only one book on each topic in the library. This is part of what drives my devotion to books, and reading, and ideas: all open endless avenues to explore, allowing each reader to forge ahead to create his or her own unique path. “The Cosby Show” always had a lesson. This episode obviously was attempting to tell kids that hard work (like reading Shakespeare) would pay off, and trying to get around it by doing something easier would come back to haunt you, like a ghostly blood-stained dagger. The show’s moral could be stated even more bluntly: Reading is good. Don’t avoid it. Just do it. Cockroach and Theo need to learn this the hard way. They likely fail the English test. Who would disagree with this moral? In our society, most parents stand with Cliff and Claire Huxtable, arguing that reading is an absolute good; always the best learning methodology. But, these arguments don’t hold water. We don’t live in a world of absolutes, and reading is not always a complete good. The two boys are right. Reading ‘The Bard’ can be a chore. On the other hand, watching and listening to Shakespeare is unforgettable. Dear reader, you must understand that I am a bibliophile extraordinaire. If I have free time, I read books. I read on the train; in between classes; before bed; with my morning coffee. I love reading. It is my hobby; my passion. I agree with Cliff and Claire Huxtable’s unstated moral: Reading provides enjoyment, intellectual stimulation and self-betterment. But, there are just certain things that should be heard, seen or experienced, and not read. Sit down and read Sophocles to yourself; then listen to or watch Oedipus the King. The difference is staggering. 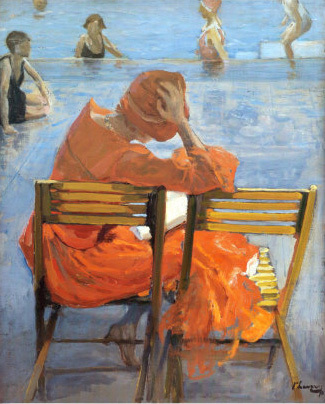 Reading the words provides beauty, but watching the tragedy performed is incomparable. This topic is on my mind because I am teaching at a branch campus this quarter, and hence, I am in the car for a couple hours a day. When in the car, I listen to audiobooks to pass the time. I would initially grab audiobooks dealing with my preferred topics of study: History, psychology, philosophy. I found that these books were good reading, but poor listening. So, a couple weeks ago, I went with something more exciting. 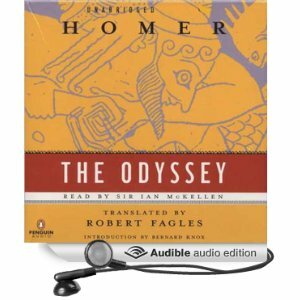 I grabbed the 11 CD audiobook of The Odyssey by Homer as read by Sir Ian McKellen. Boom! Incredible. This wasn’t my first run-in with Homer. I read The Odyssey my Sophomore year in college for a Western Civilization course. Our professor told us on Tuesday to read the 500-plus page epic by that Thursday. This was ridiculous. Of course, I read the book as fast as possible, skimming through the ‘unimportant’ parts. My experience with Telemachus, Circe, Odysseus and the Cyclops was tainted. Though it has so many recognizable moments, reading the work frantically felt repetitive, and truthfully, boring. That was 15 years ago. I thought I would give it another go with the recorded version. Listening to the words, not reading them to myself, clarified the absolute power of Homer’s masterpiece. 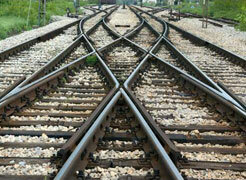 The beauty of the language and the psychological introspection of character was magnified ten-fold. Even the repetition (necessary since the work was orally relayed from bard to bard) started to become addictive and beautiful. Listening to the reoccurring descriptions was a welcome occurrence, not an annoyance. 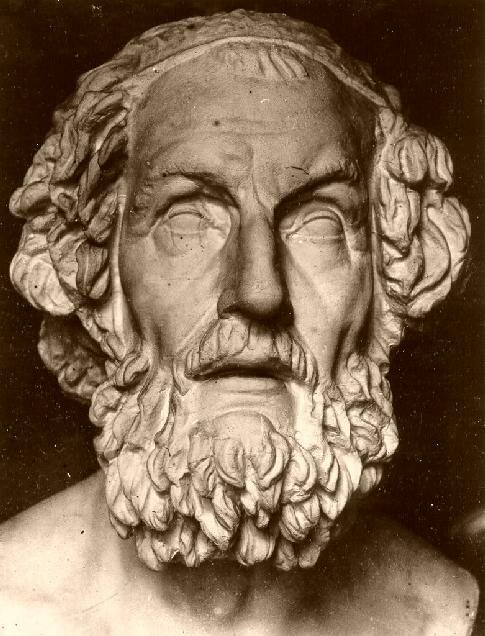 The Greeks did not lionize the written word above other methods of pedagogy. How could they with their cultural inheritance of Homer? How could they when the tragedies of Sophocles and Euripides were central to civic life? How could they when Socrates was questioning Athenians in the Agora? To be honest, Socrates thought quite negatively of the written word. 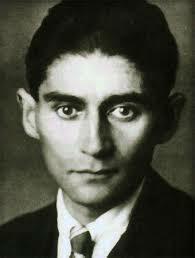 He was concerned that reading and writing may ruin the skills of conversation, argument and memory. In this belief, Socrates was far too radical. Reading is obviously wondrous. 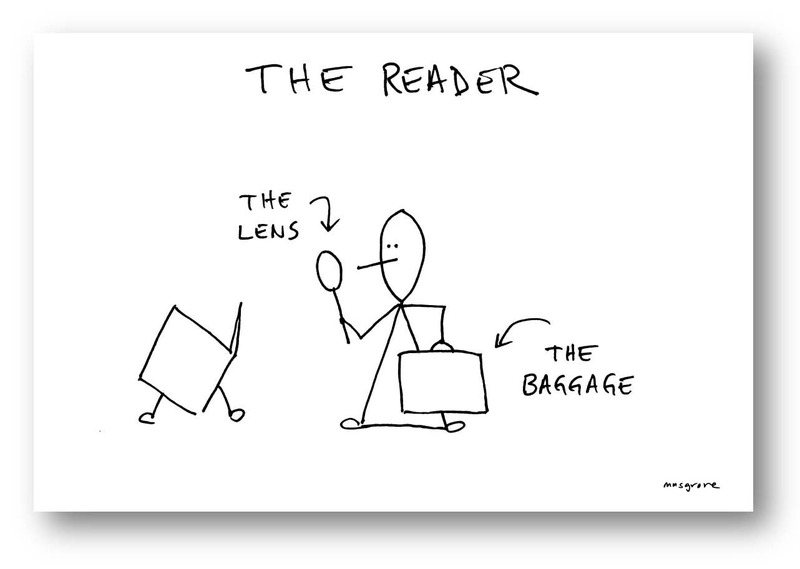 But, the opposite belief that reading is the only correct way to learn is just as radical, and just as wrong. Theo and Cockroach had the right idea about that, methinks.